I had some of the early ancestors of these Raitts in my master file, and their tree is (was!) included under Angus trees; but since I could not yet find a link to my family, then they were put on one side while I concentrated on more relevant families. However, when I was contacted by someone now living in South Carolina asking for assistance in finding out more about her father’s family who had emigrated to New Jersey in the 1920s, then the voyage of research and discovery led me back to the Raitts of Conon and Colliston. Much more recently I was asked by someone living in Coatbridge, Lanarkshire to try and find more about her family - and astonishingly it has led me to the same early family! And even more recently still, the fly leaf of a family bible led to other members of this same family and provides much information on the descendants of one particular man from Grange of Conon - that of David Rait (also Reat), born 1690. 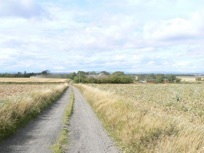 There have been early Raitt families at Grange of Conon, East Grange of Conon, Mill of Conon, Cononsyth etc and later others at nearby Cotton of Colliston, Mill of Colliston, West Muir of Colliston, South Muir of Colliston, Burnside of Colliston, Woodside of Colliston, Swirlburn and so on. Under St Vigeans on the Raitt families in the 1841 census, it is revealed how the various members - probably brothers - lived in close proximity to each other. There are also a few at next door Newgrange, Tarry and Boysack. In the main they were farmers or crofters and weavers in their spare time and were likely all related (see blog entry). Where they originated is not yet fully appreciated, but it may be from the Raitts of Hallgreen/Cononsyth and this will examined in the near future. And whether they are related to “my” Raitts from St Vigeans and Arbroath is again not fully explored – but it will be! Some of my much earlier gathered relationships between some of these families turns out to be incorrect following the more in-depth work I have now done. There is still much work to be carried out on this branch of Arbroath/St Vigeans Raitts, but I have created this separate page for them here – primarily for the direct ancestors of the New Jersey Raitts and Lanarkshire Raitts, though I will eventually provide details on the other siblings (who are anyway listed in the family tree below.) Many of these Raitts are buried in St Vigeans churchyard where their gravestones provide some useful details. Indeed, one of them mentions a Meikison - the same uncommon name appearing in my own ancestry - so this might provide a clue to establish ties. and died on 8 February 1882 in Forfar. He was married three times: to Jane Greig; Jean Robertson; and Jane (Jean) Mudie - having a total of thirteen children with them. It is John whose marriages and his offsprings birth and death dates are listed on the fly leaf, which says Grange of Conon at top right, in the family bible. Jane was born in 1828 in Brechin and died in 1852. She bore John three children: James (1847), David (1849) and Isabella (1851). After Jane's death, John married Jean Robertson on 20 January 1854 in St Vigeans and they had six children: Jane (1854), Mary Ann (1855), Joan (1857), William (1859), Joseph (1862), and Alexander (1863). Most of Jean Robertson's children died young: daughter Jane died aged only four months, her daughter Mary Ann died aged four, her daughter Joan was 16, her son Willian was just over 17 months, and Joseph drowned aged 29. Jean herself was born about 1827 in Forfar and died there in 1864. John clearly liked women named Jean/Jane and getting married in January! Almost exactly one year after Jean Robertson died, John married Jean Mudie on 2 January 1865 in Forfar. John had a further four children with her: Mudie (1865), William (1867), Guthrie (1870), and Sarah Newton (1873). The firstborn, Mudie, was not yet five when he died. It is not exactly clear when Jane Mudie was born. On her marriage to John her age was given as 41 (thus born 1823), and when she died in 1917 her age was given as 94 (thus also born 1823). However, her age in the censuses varies from 1823-1828 (and place of birth given as Brechin, Kirriemuir and Dundee). And to make it even more difficult, her marriage extract to John gives her parents as Peter Mudie (wright) and Christina McAulay, while her death extract gives her father as William Mudie (joiner), though mother still Christina (McAuley). Now, a Peter Mudie and Christian Mcauly had a daughter named Jean born in Dundee on 16 November 1827 and baptized on 2 December (another record naming the mother as Christian Mccally gives the birthdate as 12 November 1827 and the place as Forfar). Peter Mudie and Christian Mcally were married in Forfar on 3 September 1824. And there was a Jean Mudie baptized on 27 July 1823 in Dundee, but her parents were John Mudie and Wilson Thomson. There does not seem to be any record of a Jean/Jane born to a William Mudie and Christina McAulay, nor a record of their marriage. When John married Jean Mudie she was actually married as Jean Dawson, being a widow. She had married Peter Dawson on 23 January 1848 in Forfar and the couple had three children. 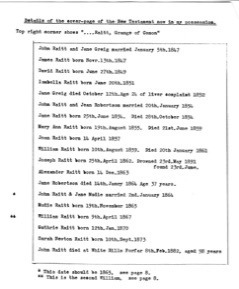 A witness at the marriage of John and Jean was William Raitt - presumably John's brother. In the 1841 census for Grange Conon, St Vigeans, John Rait, 15, linen hand loom weaver, is living at home with his father, James Rait, 60 farmer; mother Isobell, 55; and siblings Alexander, 15, linen hand loom weaver; and Agnas, 15, linen hand loom weaver. In the 1851 census for Leys Mill, Inverkeillor, we have John Raitt, 26, quarry labourer, born St Vigeans; wife Jane, 25, born Brechin; sons: James, 2; and David, 1 - both born Inverekeillor. In the 1861 census for Teuchar Croft, Forfar, Angus, we find John Raitt, 1825, pavement quarrier, born St Vigeans; wife Jane, 33, born Kirriemuir; children: David, 11, scholar, born Inverkeillor; Isabella, 9, scholar, born Inverkeillor; and Joanna, 5, born Forfar. In 1871 living at South Whitehills, Forfar we find John Raitt, 46, stone dressers labourer, born St Vigeans; wife Jane, 43, born Dundee; children: Isabella, 19, factory weaver (linen), born Inverkeillor; Joanna, 14, factory weaver (linen); Joseph, 8, scholar; Alexander, 6, scholar; William, 4; Guthrie, 1 - all born Forfar. Also in the household is Margaret Dawson, step daughter, 22, factory weaver (linen), born Forfar. She was the daughter of John’s third wife, Jane Mudie, from a previous marriage. In the 1881 census for Whitehills, Forfar, Angus there is John Raitt, 56, pavement dresser, born St Vigeans; wife Jane, 53, born Dundee; children: Joseph, 18, iron moulder; Alexander, 17, iron moulder; William, 13; factory worker; Guthrie, 11, scholar; and Sarah, 7, scholar - all children born Forfar. It is understood that William Raitt, the eleventh child, of John Raitt died in Canada - but no details have yet been forthcoming, either in travel documents or Canadian censuses up to 1921. He is found in the 1891 census in Dundee as a factory worker living with his brother Guthrie, and it is probably him in the 1901 census for Liff & Benvie (Dundee) where there is a William Raitt, aged 33, jute tenter, born Forfar, living at 88 Annfield Road, St Peters, with his mother Mrs Jessie Raitt, aged 76, widow, born Dundee. Since Jessie is also a name used for Jean/Jane, then this is likely to be Jean Mudie. (In the 1911 census for St Andrews, Dundee, living at 1 Eliza Street, is Jane M. Raitt, 86, a widow, born Dundee, working as a housekeeper.) William is not found in the 1911 census in Scotland. The William Raitt, single, aged 40 (thus also born 1867) departing Liverpool to New York on 19 September 1907 aboard the Baltic and arriving on the 28 September is probably not him. He was a stone cutter with a last permanent address in Aberdeen. Also his nationality is given as American (with the over stamp US Citizen Disch. on Pier). (Nor is he likely to be the William Raith, aged 40, who arrived on 26 April in Montreal from Liverpool aboard the Corsican. He seems to have been born in England, was married, and was a returning Canadian resident.) I have not been able to find his death in Scotland. Family legend has it that he "fled" to Canada and changed his name to MacLean. Guthrie Raitt was the penultimate (twelfth) child of John Raitt - the offspring of his third wife Jane Mudie. He was born on 12 January 1870 in Forfar, Angus and died in Liff, Benvie and Invergowrie, Angus on 29 March 1932. On 26 August 1898 in Montrose he married Emily Price, who was born in Llannllawddog, Carmarthenshire, Wales on 10 April 1875. She was the daughter of William Price, born 1936 in Llanfair Caereinion, Montgomeryshire, Wales and dying before 1891 in Wales, and Ann(e) Smith, born abt 1835 in Clun, Shropshire, and dying in Uddington, Bothwell, Lanarkshire in 1913 - they had married in 1857 in Clun and had eight children, Emily being the seventh. She died in Dundee on 3 December 1953 and her son John was the informant. Like his father John, Guthrie and Emily had thirteen children between 1899-1917: John (1899), Jane (1901), William (1902), James Lindsay (1903), Alexander (1904), Guthrie (1906), Agnes Meek Warden (1907), Emily (1909), George Warden (1910), Margaret Hanley (1911), David (1913), Norman (1915, and Bruce (1917). Of their nine sons, only five seemed to have had children. It has been a bit of a detective story trying to track Emily Price down! I was curious to learn how and why a young Welsh lass had ended up getting married in Montrose, Scotland. Her father, born in Wales about 1836, had moved to Clun, Shropshire at some point, where he married Anne Smith in 1857. In the 1861 census, he is a sawyer and had two daughters born in Clun. In the next few years three sons were also born in Clun. However, between 1867 and 1869, the family moved to Wales - presumably first to Cardiganshire where another son was born, though in the 1871 census they were in Llanllawddog, Carmenthshire, and William was now a gamekeeper. Emily first appears in the 1881 census for Llangunnock, Carmarthneshire along with another new daughter. William Price was dead before 1891, for in the census for that year we find Ann Price, widow, living in Llanstephan, Carmarthenshire together with her three-year-old grandchild, Ellen Grace Hanley. Emily is probably the 16 year-old servant in the large Hughes household also in Llanstephan. Now, Ellen Grace Hanley was the daughter of William and Anne Price's daughter Margaret Ann who had married Irishman Thomas Hanley. In the 1891 census they are living in Portsea, Portsmouth, Hampshire, England, where Ellen Grace was born, Thomas was a sergeant in the Royal Marine Artillery. A few years later, Thomas, Margaret Ann and Ellen Grace moved to Scotland as the family is to be found in the 1901 census for Bothwell, Lanarkshire. There were three other daughters - all of whom were born in Montrose, Angus between 1895-1898! Also in the household were mother-in-law Ann Price, widow, and sister-in-law Annie Price (the youngest of the Price children). My assumption is then that Ann Price saw no reason to remain in Wales and decided to move to Scotland (probably Montrose initially) to perhaps help look after new grandchildren. She took with her her daughters Emily and Annie and it was while in Montrose working as a domestic servant that Emily met and married Guthrie Raitt! At the time of the 1911 census for Uddingston, Bothwell, Margaret Ann was a widow and her mother Anne Price, 75, was still living in the household. She died just a couple of years later and granddaughter Ellen Grace was the informant. In the 1891 census for James Street, St Andrew, Dundee, we find Guthrie Raitt, 21, house painter, born Forfar, living with his widowed mother Jane, 66, born Dundee; his brother William, 24, factory worker, born Forfar; and sister Sarah, 17, factory worker, born Forfar. In 1901, Guthrie Raitt, 31, painter (house), born Forfar, had moved to 125 Albert Street, Dundee where he was living with his wife Emily, 25, born Wales; and children John, 1, born Dundee; and Jane, 2 months, also born Dundee. In the 1911 census for 131 Albert Street, Dundee, we find Guthrie Raitt, 40, master painter, born Forfar; wife Emily, 35, born ; and children: John, 11, at school; Jane, 10, at school; William, 9, at school; James L., 7, at school; Alexander, 6, at school; Guthrie, 4; Agnes, 3; and George, 7 months. Guthrie and Emily had been married for twelve years and had nine children all of whom were still living at the time of the census and all born in Dundee. At the time of his mother's death in 1917, it looks like Guthrie and family and also his mother were living at 2 Park Avenue, Dundee, because on her death extract the informant is Guthrie and he is described as son and occupier of that address. Guthrie Raitt of West Green, Liff died on 29 March 1932, testate, confirmed on 23 June to Emily Price or Raitt living at 21 Lawton Road, Dundee, Executrix. The will was dated 9 May 1927 and was recorded in Dundee on 17 June 1932. The value of the estate was £1397:16:3, The probate was sealed on 9 September 1932. Not a tremendous lot is known about all of Guthrie Raitt's children. All but two appear to have stayed in Scotland. Guthrie and Emily's son James Lindsay Raitt was born in Dundee on 2 May 1903. In 1926 he emigrated to Canada, setting sail from Greenock to Quebec aboard the Montcalm on 24 April. He was aged 22, a farm worker, travelling in third class and his last address in the United Kingdom was 2 Park Avenue, Dundee. He intended to make Canada his country of future permanent residence. He returned to Scotland on 22 June 1930 travelling in 3rd class from Montreal to Glasgow aboard the Letitia. He was 27 and described as a shipper and his destination was 21 Lawton Road, Dundee. Canada was his country of last permanent residence. He is then recorded as departing Glasgow on 12 September 1930 and arriving in Quebec on 20 September aboard the Melita. He was unmarried, aged 27, born in Dundee and a labourer with $25 in his pocket. Although his nationality was British, he was classed as a returning Canadian and had paid his passage himself. He stated that he had been in Canada before from 24 April 1926 to 13 June 1930 in Winnipeg, Manitoba. His destination on this return trip was 124 Revelstone Avenue, Transcora, Manitoba which was his home. He gave the name and address of his father as his nearest relative back in Scotland: Guthrie Raitt, 21 Lincoln Road (sic), Dundee. His passport, number 98027, had been issued in Ottawa on 6 May 1930. On 14 December 1935 James married Annie (Nancy) Clifford, presumably in Manitoba. She was born on 17 July 1906 and she died on 13 March 1963 in Manitoba. James died there on 14 November 1974. The couple had three children: Jean (1936), James Clifford (1938), and Margaret Ruth (1943). It would appear that Guthrie Raitt Jnr emigrated to South Africa. Records state that Guthrie Raitt was born on 21 April 1906 and died on 21 January 1985 in Richmond, Northern Cape, South Africa. His wife was Margaret Frances (or Fraser) Walker, whom he married on 18 November 1930. She was born on 20 December 1906 and died in nearby Pietermaritzburg on 12 Dec 1984. In the Voter Index for 1931, Guthrie Raitt, a carpenter, is living at 17 Dingaan St, Krugersdorp, Transvaal. Margaret Fraser Raitt, a housewife aged 31, departed Durban for Southampton arriving on 4 July 1938 on the Dunvegan Castle. Her intended address in the UK was 3 Burn St, Downfield, Dundee. Guthrie is recorded leaving Southampton for Cape Town on 24 April 1958 aboard the Winchester Castle. His date of birth is given as 21 April 1906, his occupation was carpenter, he was a South African citizen and his country of last residence was Scotland and his last address was 11 Burn St, Downfield, Dundee. It is worth noting too that one of the sons (possibly both) of the youngest of Guthrie and Emily's children, Bruce Raitt, seem to have emigrated to New Zealand, married there and had children themselves. Mention should also be made of Guthrie and Emily's son, George Warden Raitt, born 6 August 1910 in Dundee and dying there in 2005, who was clearly very interested in finding out more about his Raitt heritage. Following preliminary investigation by his nephew Ian and with assistance from Edith, his nephew Guthrie's wife, his extensive research led to his writing in 1990 a document entitled "What's in a Name? 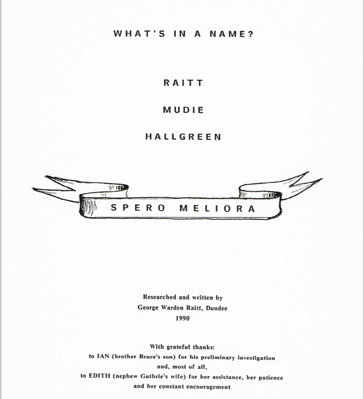 Raitt Mudie Hallgreen." His quest began when he received the old family bible which recorded the family of his grandfather, John, on the flyleaf (see images above). This enabled him to trace, with reasonable certainty, his male line back to David Raitt (Reat) in 1690 in Cononsyth and Grange of Conon. 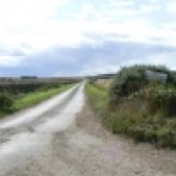 (See also Hallgreen Raitts of Angus). The document provides dates of birth, marriage and death for many of the people in his tree (unfortunately no locations) plus some brief details about his uncles. The first chapter covers the Raitts, while the second chapter is all about the Mudies who married into the Raitts at various points. Chapter 3 digs into the Raits of Hallgreen in an effort to uncover more of the Raitt history. Much of this information, of course, will also be found on this website under the Raits of Hallgreen page and elsewhere such as Religious Raitts. A supplement to the booklet provides additional details on some early Raitts as well as giving details, current in 1998, on George's siblings wives, children and grandchildren. Besides discussing the Raitt families in and around Grange of Conon and Colliston - some of whom subsequently moved to Glasgow and, particularly Dundee, this page also covers the direct ancestors of the New Jersey Raitts and the Lanarkshire Raitts. Since it is rather lengthy, I have chosen to give the tree showing what is currently known about all the descendants of David Raitt/Reat, born 1690 on a separate page. Additional information will be added in due course. I think I have said elsewhere that I wondered whether my own ancestry could be traced back to the Raitts of Grange of Conon. Sadly there is no DNA match between me and a direct male descendant of Guthrie Raitt! Francis Raitt, born 10 January 1746 (abode Grange of Conon), was the second son of James Raitt (Reat) and Margaret Soutar. He married Jean Watt on 5 August 1773 in St Vigeans. Jean was baptized on 7 October 1749 in St Vigeans, daughter of James Watt and Isabell Mitchell - and thus sister to his brother David’s wife, Margaret. Francis and Jean had at least four children: David (born 1774); James (born 1777) (see below); Margaret (born 1781); and Alexander (born 1787). All born in Grange of Conon. Francis and Jean’s eldest son David, baptized on 22 June 1774 in St Vigeans, married Margaret Chapel on 20 December 1800 in St Vigeans and the couple had ten children between 1802-1820. Their sixth child, Jonathan, born 26 May 1811 in St Vigeans, went on to be a respected ship captain, later ship owner, and some details about him will be found under Arbroath Mariners and Raitt Wrecks. James Raitt was the second son of Francis Raitt and Jean Watt, born on 9 November 1777 at Grange of Conon, St Vigeans and dying there about 1845. He was a crofter and married Isobel Brown in St Vigeans on 3 August 1811. Isobel was born on 21 March 1777 in Inverkeillor, Angus, daughter of William Brown and Isobel Thom. She died sometime after 1851 at Grange of Conon. The couple had eight children between 1811-1837 - two daughters followed by four sons, then two more daughters - the early ones born at Muir of Boysack, others at Grange of Conon. The third child and eldest son of James Raitt and Isobel Brown was William, christened 12 April 1814 in St Vigeans. He married Catherine Robbie on 29 May 1833 in St Vigeans - she was apparently born in 1811 in Tannadice, Angus - though the censuses have her born about 1814 in St Vigeans. The couple had three children: Charles (born 1835); Mary (born 1841); and William (born 1847). William was a farmer at Mill of Colliston and died there on 29 January 1893; his wife died there a couple of years later on 8 October 1895. In the 1841 census for Grange Conon, St Vigeans, there is William Rait, 25; wife Katrine, 25; and children: Charles, 6; and Marey, 0. All born Angus. In 1851 the family is still at Grange of Conon: William Raitt, 35, quarrier; wife Cathrine, 37; children: Charles, 16, hand loom weaver (linen); Mary, 9, scholar; and William, 3 - all born St Vigeans. In the 1861 census, the family is living at Gowanbank, St Vigeans Landward: William Raitt, 45, stone quarry contractor employing sixteen men; wife Catherine, 46; children: Mary, 19, linen weaver (handloom); and William, 13. Also in the household is Joseph D. Watt, 0, grandson. This is Mary’s child. The 1881 census for Colliston Estate, 5, St Vigeans has William Raitt, 65, crofter of 8 arable acres; wife Catherine, 69; and grandson Joseph Watt, 20, quarry fireman. All born St Vigeans. Alexander Raitt was the third son and fifth child of James Raitt and Isobel Brown. He was born in 1824 in St Vigeans and married Ann Carrie on 12 November 1847 in St Vigeans. She was born in 1835 in St Vigeans and died in Slade, Carmyllie, Nagus in October 1890. Alexander died there a year later on 30 November 1891. Like others in his family, Alexander was a quarrier and sometime farmer. In the 1841 census for Grange Conon, St Vigeans, Alexander Rait, 15, linen hand loom weaver, is living at home with his father, James Rait, 60 farmer; mother Isobell, 55; and siblings John, 15, linen hand loom weaver; and Agnas, 15, linen hand loom weaver. The 1881 census for Muir of Edzell, High St, Edzell has Alexander Raitt, married, 58, ag lab, born St Vigeans in household of farmer Peter Smith and family. His wife, Ann Carrie, 53, wife of Alexr Raitt, quarrier, is living at Swirlburn, 10, St Vigeans, together with the granddaughter Jane Ann Raitt, 6, born St Vigeans. This is presumably the child of one of Alexander’s three daughters. 1891 census for Slade, Carmyllie has Alexander Raitt, widower, 67, stone quarrier; granddaughter Jane Ann Raitt, 16, house keeper - both born St Vigeans. James Raitt was christened on 7 April 1791 in St Vigeans, having been born at Colliston. He was the fifth child of David Raitt (see above) and Margaret Watt who married in 1776. James married Marjory Sibbald on 26 April 1822 in St Vigeans. Marjory had been christened on 4 April 1798 in St Vigeans, the middle one of five children born to John Sibbald and Marjory Millar who had married on 10 November 1792. James died in St Vigeans in 1886, Marjory have previously died there in 1870. James and Marjory had six children: John Sibbald (1823-1899); Margaret Watt (1825-); Jessie (1827-1908); David (1829-1891) (see below); Marjorie (1832-1911); and Barbara (1834-1902). In the 1841 census for St Vigeans, living at Cotton of Colliston, is James Raitt, 45, farmer; wife Marjorie (40); and John S. (15, book closer); Margaret W. (13); Jess (11); David (9); Marjorie (7); and Barbara (5). Living next door at West Muir of Colliston is William Raitt, 60, farmer. This could be the William, born 1781 to Alexander Raitt and Ann Napier, abode Mains of Tarry. Also living next door at South Muir of Colliston is John Raitt, 50, farmer; wife Jean, 55, children Margrett, 15, Ann, 13, William, 7, David, 5. Living almost next door at Woodside of Colliston is Jean Raitt, 12, female servant in the family of James and Jean Mitchell. This is probably John’s daughter. The 1861 census for Cotton of Colliston, St Vigeans has James Raitt, 70, born St Vigeans, farmer of 60 acres employing one boy; wife Marjory, 63, born St Vigeans; children Jessie, 33; David, 31, ag lab; Marjory, 27, milliner; Barbara, 25 – all born St Vigeans; and Mary A. Gibson, 81 , born St Vigeans, sister and widow of ag lab. The 1871 census for Cotton of Colliston, St Vigeans has James Raitt, head, widower, 80, farmer of 14 acres of land, born St Vigeans; unmarried daughters Marjory, 38; and Barbara, 36 - both farmer's daughter, born St Vigeans. David Raitt was christened on 1 May 1829 in St Vigeans, Angus. He was the fourth child of James Raitt (see above) and Marjory Sibbald who married on 26 April 1822 in St Vigeans. David married Louisa Bowden on 26 November 1862 in St Vigeans. Louisa had been born in Lunan, Angus on 2 December 1838 to Samuel Bowden and Margaret Reid who married in Inverkeilor on 7 August 1824. Louisa was their fourth child after a lengthy gap, the other two being Mary (1826) and Ann (1829) – both born in Inverkeilor. Louisa was almost certainly named (as seems to have been common) after the third child, Louisa Smith Bowden, who was born in Inverkeilor on 21 October 1831 and must subsequently have died young. Samuel was the corn miller at the Mill of Colliston, St Vigeans and also farming 16 acres. Living close by at Cotton of Colliston were the Raitt family, so it is no surprise that David Raitt should be enamoured with the girl next door! At the date of their marriage David was 33 and a farmer overseer residing at Cotton of Colliston and Louisa was 23 and a general house servant residing at the Mill of Colliston, where they actually got married. One of the witnesses was Annie Bowden, probably Louisa’s elder sister. David died in Arbroath in December 1891 and Louisa died there in 1909. In the 1841 census for St Vigeans, living at Cotton of Colliston, is James Raitt, 45, farmer; Marjorie (40); John S. (15, book closer); Margaret W. (13); Jess (11); David (9); Marjorie (7); and Barbara (5). Also David Scott, 15, agricultural labourer. In the 1851 census for Cotton of Colliston, St Vigeans is James Raitt, 60, born St Vigeans), farmer of 65 acres employing two labourers; plus wife Margaret Sibbald, 52, born St Vigeans); children Jessie, 23, employed on farm; David, 21, employed on farm; and Barbara, 16, employed on farm - all born St Vigeans. The 1861 census for Cotton of Colliston, St Vigeans has James Raitt, 70, farmer of 60 acres employing one boy; wife Marjory, 63; children Jessie, 33; David, 31, ag lab; Marjory, 27, milliner; and Barbara, 25 – everyone born St Vigeans. Also there is Mary A. Gibson, 81, born St Vigeans and described as sister and widow of an agricultural labourer. She is the eldest sister of James and married John Gibson in 1820. In the 1891 census for Millgateloan, Arbroath we find David Raitt, head, 61, dairyman's assistant, born St Vigeans; wife Louisa, 52, born Lunan; children: James, unmarried, 27, grocer’s vanman; David, unmarried, 21, boot finisher; Louisa, 15, tow reeler; Marjory, 13, bobbin filler - all born St Vigeans. David died in December 1891, but in the 1901 census for 24 Millgate Loan, we find his son David (Sibbald) Raitt, head, already a widower at 31, shoe maker (finisher), born St Vigeans. In his household are his son David, 7, scholar, born St Vigeans; daughter Jessie, 4, born Arbroath; his mother Louisa Raitt, 62, widow, housekeeper, born Lunan; his nephew James, 9, scholar, born Arbroath; his nieces Louisa, 4, and Elizabeth, 2 – both born Arbroath; and his sister-in-law, Jessie, married, 29, domestic servant, born Montrose. Jessie is, of course, the wife of David’s brother Samuel Bowden who was presumably away at sea. 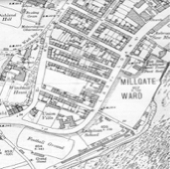 Just up the road at 36 Millgate Loan are David and Samuel’s two sisters Louisa, 25, and Marjory, 23 – both laundresses and visiting Jane Gauldie, 58, also a laundress, born Lunan. Samuel Bowden Raitt was born on 29 October 1867 in St Vigeans, Angus, the second eldest child and son of David Raitt (see above) and Louisa Bowden who married in St Vigeans in 1862. He married Jessie Taylor on 29 December 1892 in Arbroath. Jessie had been born on 10 April 1871 in Rosemount Cottage, Montrose, Angus, the illegitimate daughter of Jane Ann Taylor. Jane Ann, born 25 February 1843, was the second of twelve children born to Ogilvy Taylor, a market gardener, (born 1814) and Jane Turnbull (born 1816) – both from Stracathro, Angus – who married in Montrose on 14 June 1840. When Samuel Bowden Raitt and Jessie Taylor got married, the residence for both was 30 Millgate Loan, Arbroath and the witnesses were his siblings James Raitt and Marjory Raitt. Samuel’s occupation was given as stoker in a steamship, while Jessie was a domestic servant. She had presumably given up her job as a millworker in Dundee and moved to Arbroath either for work or to be with Samuel. Although whether she met Samuel in Arbroath or when perhaps his ship docked in Dundee is not known. Samuel died in 1946 in St Vigeans, and Jessie died a few years later in January 1951 in Arbroath. In the 1891 census for Medway, Kent, England we find Samuel Raitt, aged 22, unmarried, born Arbroath, working as a donkeyman aboard the S/S Daisy (schooner iron steamer). Samuel is not found in the 1901 census – presumably he was away at sea. (He may be the Samuel Boden, aged 36, married, and master of the F. T. Barry (cargo steamer) found at Lowestoft, Suffolk, England on the night of the census.) However, now married, his family is to be found at 24 Millgate Loan, Arbroath/St Vigeans in the household of his younger brother David Raitt, head, widower, 31, shoemaker (finisher), born St Vigeans. Living there also are David’s son David, 7, scholar, born St Vigeans; daughter Jessie, 4, born Arbroath; mother Louisa, widow, 62, housekeeper, born Lunan, Angus; James, nephew, 9, scholar, born Arbroath; Jessie, sister-in-law, married, 29, domestic servant, born Montrose, Angus; Louisa, niece, 4, born Arbroath; and Elizabeth, niece, 2, born Arbroath. Samuel clearly gave up the sea - in the 1895 Valuation Roll for Arbroath he is listed as a fireman and in the 1911 census for 5 Glover St, Arbroath, we find Samuel Raitt, head, 44, carter for railway company, born St Vigeans; wife Jessie, 40, born Montrose; children: James, 17, turner in engineering works; Louisa, 14, weaver in canvas factory; Elizabeth, 12, school; Samuel, 7, school; Marjory, 4; Walter, 2 - all born St Vigeans. 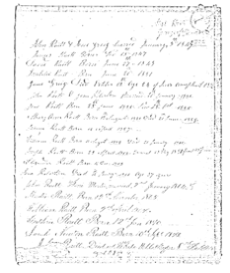 The census notes that Samuel and Jessie had been married for 18 years and had had 6 children all of whom were still living. David married Jean Leslie (various spellings) probably around 1720 since they had ten children between 1721-1747, the eldest of whom was James (see below). There are two Jean Lesslies born in Angus in the right time frame, though she is probably not the Jean Lesslie born 28 May 1680 in St Vigeans to Thomas Leslie since she would be ten or more years older than David, and anyway she is probably the Jean Leslie who married James Smith on 30 April 1697 in Arbroath. More likely is the Jean Lesslie born on 2 Dec 1700 in Panbride to John Lesslie and Marie Davidsone. David Raitt and Jean Leslie appear to have two sons named John (one born 1724, the other 1739 in Grange of Conon) then I assumed that perhaps the earlier one had died and the second had been named after him as was common. However, the one born in 1724 seems to have married Margaret Morgan and had six children between 1745-1762. There are other anomalies - as is always the case with people with the same names born around the same time. The records show that a James Reat was baptized on 24 October 1742. His father was named as David Reat, weaver, abode Ground of Colliston. Whether this is the eleventh child of David Raitt and Jean Leslie - the date would certainly be right - we cannot be sure, especially as their eldest child was also named James and was alive until 1753 at least. However, there does not appear to be another David Reat/Raitt that I have come across in the right timeframe yet. David Raitt was christened in St Vigeans (abode Grange of Conon) on 25 January 1744. His parents were James Raitt (see above) and Margaret Soutar(also given, incorrectly as Seaton) and he was their firstborn. There seems to be a little confusion about his birth - the parish registers show a David Reatt being baptized on 25 January 1744 in St Vigeans - with his parents being named as James Reatt and Margaret Seaton and their abode being Grange of Conon. Another record (bearing the same file number) has a David Reet being baptized on 10 March 1745 in St Vigeans - the father only being named as James Reet, smith, abode Grange of Conon. It is possible that Seaton was a misspelling of Soutar/Souter and that the first record was his birth date and the second his baptism - though more than a year between birth and baptism is overly lengthy. David married Margaret Watt on 6 September 1776. Margaret was christened on 7 October 1752 in St Vigeans (her abode was Colliston) and her parents were James Watt and Isobell Mitchell both of St Vigeans who had five daughters between 1740-1752, Margaret being the last born. David and Margaret had six children between 1778-1793: Mary A. (1778-1871); Jean (1780-); John (1784-1854) (see below); David (1787-); James (1791-1886) (see below); and Alexander (1793-). 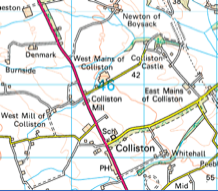 Most, if not all, had their abode at birth as Colliston. John Raitt was baptized in St Vigeans on 22 May 1784 - the second son of David Raitt and Margaret Watt. He was a linen weaver and a farmer and married Jane Beattie, born 1792 in Inverkeilor, Angus on 20 August 1819 and with her had three daughters. Jane died shortly after daughter Jean was born in 1829 and soon afterwards John married Barbara Matthew, born 1803 in St Vigeans. The couple had two sons, William in December 1831 and David in 1833 - but unfortunately Barbara died a couple of years later in 1835. Son William moved to Glasgow where he married Isabella Jane Phillips in 1855 - their story is to be found under Lanarkshire Raitts. Son David married Mary Peter on 7 June 1862 in Arbroath and they had two children: George Peter in 1863 and Margaret Jane in 1865. Mary Peter was born on 27 August 1829 in Arbroath, the last of at least four children born to James Peter and Helen Smith. Her brother George, born 1 February 1815 in Arbroath, married Margaret Raitt on 24 June 1841. Margaret was the daughter of John Raitt and Jane Beattie, baptized on 3 July 1820. David and Mary’s son, George Peter, married Mary Kippen in 1886 in St Vigeans and the couple had five sons and a daughter between 1887-1896 - all born in Kelvin, Glasgow. But first a little interesting historical diversion. 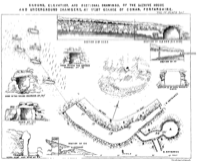 A partially-rock-cut souterrain at West Grange of Conon was discovered during agricultural operations in the spring of 1859 and excavated by Jervise in 1860 and 1861 and written up by him in 1863. It consists of a main passage leading to a "beehive" chamber, and a narrow entrance passage with an unusual subsidiary passage leading to a second entrance. To the north of the souterrain was a circular area of rough natural bedrock paving. A cluster of six long-cists containing human skulls and decayed bones was found to the north west of the main passage - the only known instance of burials which can be almost certainly associated with the souterrain builders. The most interesting of the numerous finds from the excavation - all donated to National Museum of Antiquities of Scotland – which included corroded iron implements and weapons, were Roman amphora fragments which may date from the 2nd century AD from above the main passage, and a bronze spiral armlet from the paved area and a possibly Roman bronze needle. In the hollow towards the south-east of the subterranean chambers, and about half a mile distant, are the ruins of an old place of worship, the reputed cell of St Vigean, who, according to Boyce, flourished during the tenth century. Near it are the remains of a so-called Druidical circle. On the north-west is the hill of Cairn Conan, the cairn upon the summit of which is clearly artificial, - probably sepulchral, - and there the court of the barony was held in old times. To the south-west is a huge monolith, called the "Cauld Stane o' Crafts." It stands upon the boundary of the parishes of St Vigeans and Carmyllie; and, in common with many such relics, its origin is attributed to a native amazon, who, while carrying it (as tradition says) from the sea-shore in her apron to the county town of Forfar, the string of the apron broke at the place where the stone now stands! "Crofts" is the name of the farm, and the monolith is also called the "Harestone," a name which, taken into account with the fact of its being upon the boundary of the parishes of St Vigeans and Carmyllie, may be considered as significant of its use, since, as shown by Borlase, the word Harz means a bound, a limit, a hindrance, derived from Armoric, as " men-liars, a bound-stone." …. Of the eight children of Samuel Bowden Raitt and Jessie Taylor we know of four who emigrated to North America. Details about the lives and known descendants of Louisa, Samuel and Janet will be found on the New Jersey Raitts page, while some details of Elizabeth will be found on the Canadian Raitts page. The eldest son of Samuel and Jessie, James Bowden Raitt, born in 1893, married Annie Crowe on 27 December 1918 in Arbroath. James was 25 and an iron turner living in Wallace St, Arbroath, and Annie was aged 19 (born 8 September 1900), living in Abbot St, Arbroath and occupied as a flare reeler. Her parents were Albert Edward Crowe, lodge keeper (and well-known piper), and Elizabeth Hunter. Interestingly, James’ father, Samuel was by this date again a factory fireman as evidenced by his occupation at James's marriage. 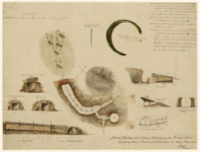 Unlike some of his siblings, James was presumably content to stay in Arbroath and build a career with the engineering company of Messrs Keith Blackman Ltd where he was employed for over forty years, having started his apprenticeship there as a turner. He worked in Dundee and London during the 1st World War in a munitions factory, returning after the War to work in a foundry in Monifeith, and then going back to Keith Blackman as a turner in 1924, where in 1949 he was appointed a progress chaser. As a young man James helped run Arbroath West End Football Club where he acted as secretary. He also helped run the YMCA Boys’ Brigade football team for many years. He was steward (wife Annie was stewardess) of the KB (Keith Blackman) Club - which he joined in 1924 - later becoming its treasurer. He was a freemason and held office in the local lodge; he became acting superintendent of the United Free Church; and he found time to play bowls - winning the championship of the Abbey Bowling Club and Abbey Green. There are numerous references to him in the local press - one of which has a photo of him dressed up as Father Christmas to distribute gifts at the Christmas Party held by the Stanley Social Club in 1953. 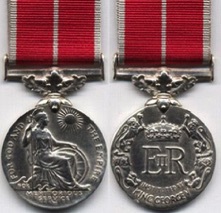 However, there is one article which captures him at the height of his social activities and achievements and that is in May 1960 when he was presented the British Empire Medal by the Earl of Airlie on behalf of the Queen, having been named earlier in the New Year’s Honours list. The Queen wrote him a letter in which she expressed regret at being unable to present him personally with the reward he had so well earned. The presentation took place in the Keith Blackman Hall at a gala function attended by many of his work colleagues. James Bowden Raitt died in Arbroath on 13 May 1961 aged 67 and was buried on 16 May in Arbroath Eastern Cemetery. His wife, Annie Hunter Crowe Raitt, died some twenty years later on 13 July 1983 and was buried in the same cemetery on 18 July. James and Annie had two daughters, Janet and Bertha. Bertha Hunter Raitt, born in Arbroath on 24 May 1921, was not only the youngest piper, but also probably the only girl piper in Scotland at the time. Her grandfather was Pipe Major Crowe who served in the Black Watch for some forty years and he obviously encouraged his granddaughter to take up the art when she was very young - she appears in a local paper aged 11 and had already given several public performances in Arbroath. She continued to give recitals and pipe in the haggis right up to her marriage. Bertha married Victor Herron, born in 1918, in Arbroath on 28 June 1941 and they later emigrated to South Africa where their daughter Sheena was born on 13 September 1958 in Town Springs, Transvaal. In fact, Victor went first - departing from Southampton to Cape Town on the Carnavon Castle on 5 June 1947. He was 27, a fitter, living at 44 Applegate, Arbroath. Bertha is recorded as travelling to Cape Town on 6 April 1948 from Southampton aboard the Winchester Castle. She was 26, married, had no occupation and her last address was 17 Palmer St, Arbroath - the home of her parents. Sheena married Gordon Robert Fryer (born 1957) on 29 September 1979 and after the death of her mother, Bertha, on 5 October 1980, they emigrated to Australia on 16 June 1981, subsequently moving to Darkan, Western Australia.